Did The Beatles visit to an ashram in India 50 years ago affect my destiny? 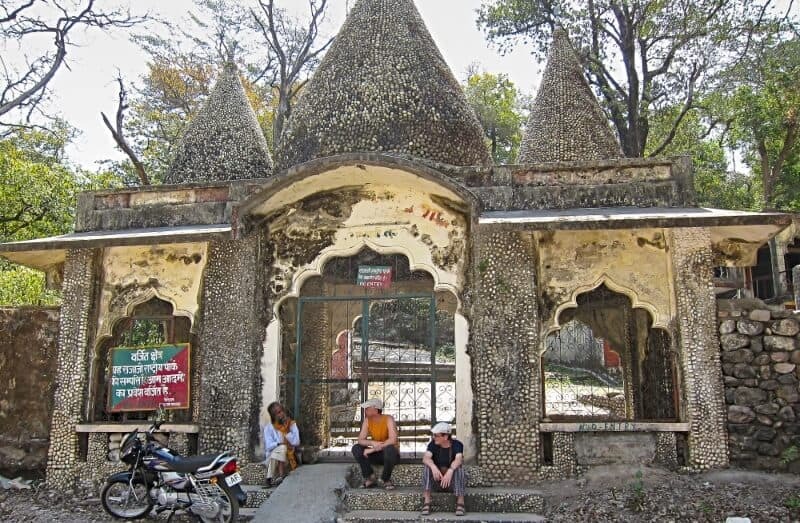 I’m writing this in my kitchen in Rishikesh. From a balcony off this room, I have a view across leafy green Yoga Niketan ashram to the Shivalik Mountains (the Lower Himalayas) and the sunrise. 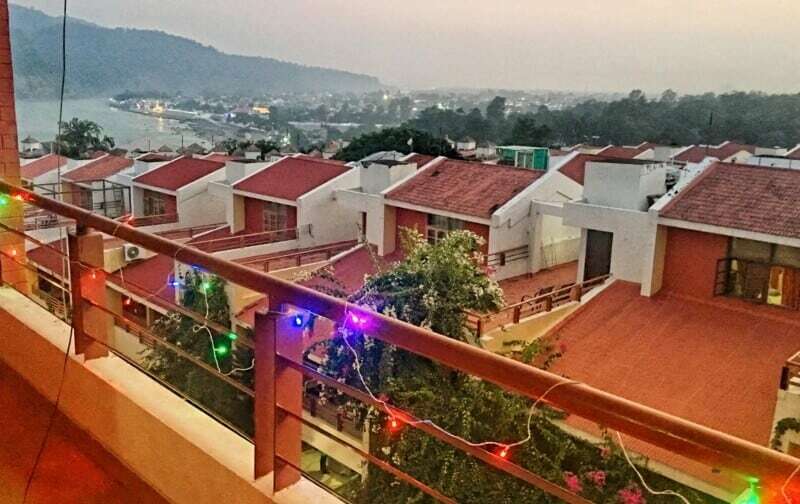 From the other balcony, off my living room, I can see the Ganga River as she leaves the mountains and begins her journey across the great plains of India, and the sunset. This airy top-floor flat is my first home in India, and it’s spectacular. Peaceful, safe, spacious, and sunny. Beautiful views out every window. I feel blessed and lucky and extremely grateful to have found this little piece of heaven. But … I can’t help wonder …. was I fated to live here? Do you believe in destiny? Read on and let me know in this Facebook discussion. I was a little girl in suburban Canada when The Beatles went to stay in a Rishikesh ashram, and would have been unaware except that my older brother Matthew was an ardent Beatles fan. Through him, I heard the music and saw the images of the fab four as they evolved from pop stars to experimental musicians and, in the case of George Harrison at least, spiritual seekers. I vividly recall seeing photos of George in sunny Rishikesh with bright marigolds around his neck. I was besotted. If I had been 10 or 15 years older, I would have followed them to Rishikesh, too. In my teens, I continued to dip my toe in the waters of Indian culture and spirituality. I became a vegetarian, burned incense, read the Bhagavad Gita, went to see Pandit Ravi Shankar perform in Hamilton, and meditated with my Mother (who discovered Maharishi Mahesh Yogi and transcendental meditation while searching for a cure for her chronic anxiety). Many years later I started Yoga and became a devoted student. And many years after that, my life was hit with a series of losses that devastated me, the worst being the sudden and unexpected death of my Mother. Struggling to keep afloat, I decided to take a Yoga teacher training course in Toronto. During that course, I had an experience that made me decide feel compelled to go to India. I landed in Delhi on December 5, 2005 and stayed with a friend of a friend, Ajay, and his family in South Delhi. 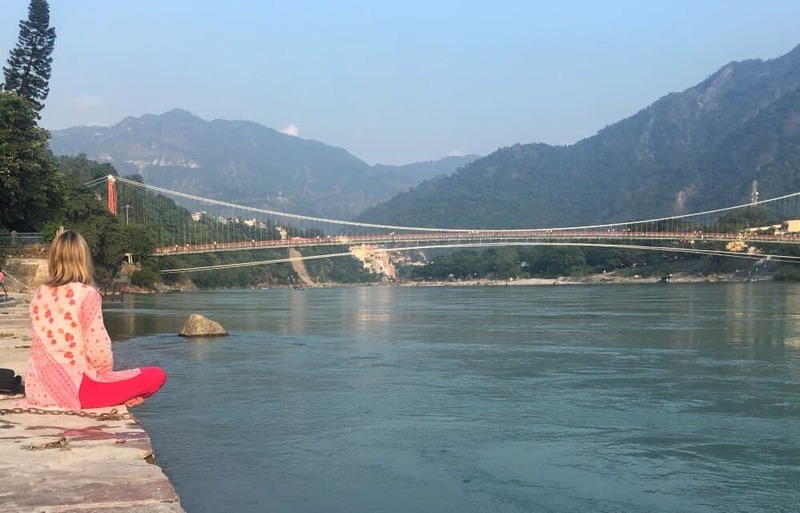 My first solo trip was to Haridwar and Rishikesh. I stayed in Haridwar at a haveli on the Ganga and I will never forget my first sight of the mighty river. All I could think about was my Mother. I could hear her voice in my head, “The Ganges! Mariellen! What an adventure!” She would have been so encouraging, so proud of me. I never thought in my wildest dreams I would ever get to India, never thought I would see the Ganga. After Haridwar, I went to Rishikesh and took part in the aarti at Parmath Niketan. I threw myself into it, lighting a little diya made of leaves and flowers, and sending it out onto the dark current of the river imbued with all my feelings of grief and loss. The ritual helped me accept that my Mother’s death was part of the cycle of life. 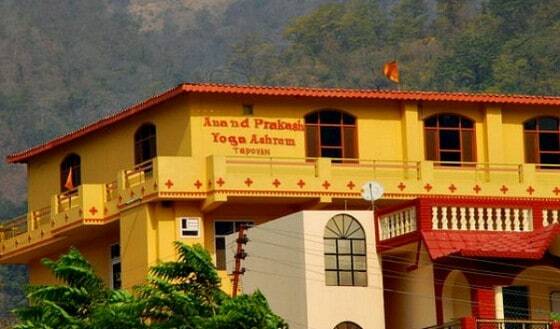 Later, near the end of that six-month trip, I discovered my spiritual home at Aurovalley Ashram, which is about 14 kilometres downstream from Rishikesh. 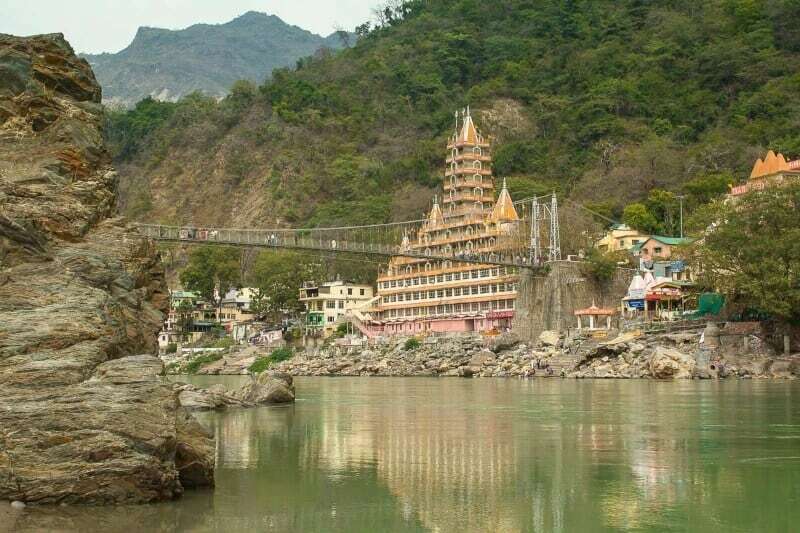 Since then, Rishikesh has always held a special place in my heart, and I have been back many, many times. 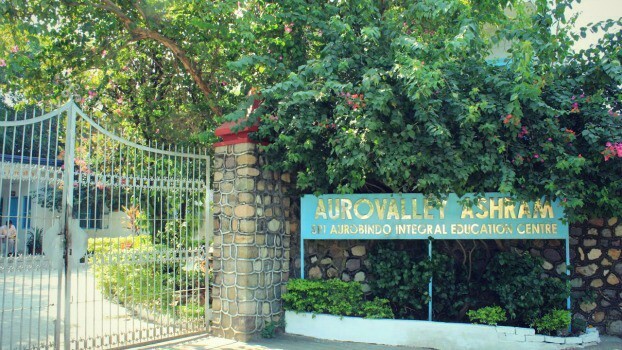 It was to Aurovalley Ashram that I went after a month of futile apartment hunting in Delhi this September. Before I left Canada this summer, I gave up my apartment in Toronto, put everything in storage, and came to India with the intention of finding a home here. My plan was to start in South Delhi, and then look in several other places on my list such as Dehradun, Rishikesh, Jaipur. A month of apartment hunting in Delhi left me despondent and depleted. I couldn’t find anything that even approached suitable. I kept my Facebook friends amused with stories of apartments with no windows or an entire wall missing, brokers who didn’t listen to me, and box-like rooms with absolutely no view. I was discouraged, I didn’t know how to find a home in India. So I did what Swami Brahmdev would suggest, and what Aurovalley so beautifully supports: I turned my problem over to the divine. I meditated for two weeks, and imagined a sunny, airy space with views of greenery. One day, a woman from Israel that I met at Aurovalley Ashram, Sarite, was going into Rishikesh, and I felt a compulsion to go with her. I didn’t really have a reason, and it’s a bit unusual for me to leave Aurovalley for no reason, but I went anyway. We went to the Pure Soul Organic Café, part of the Dewa Retreat, for lunch and the owner Gaurav Sajwan spotted me and invited me to stay one night. And so I did, and while there I told him about my apartment search. “I know a great place,” Gaurav said. He made a call, we jumped in his car, and drove for about five minutes to a gated housing complex on the bypass road, near Yoga Niketan. It’s a peaceful location up the hill, with the forest on one side. The manager pointed up to the apartment, and said it was on the top floor, and I had already pretty much decided to take it. Ten days later I moved in. This beautiful apartment includes the rooftop terrace, and I have a key to the locked door. 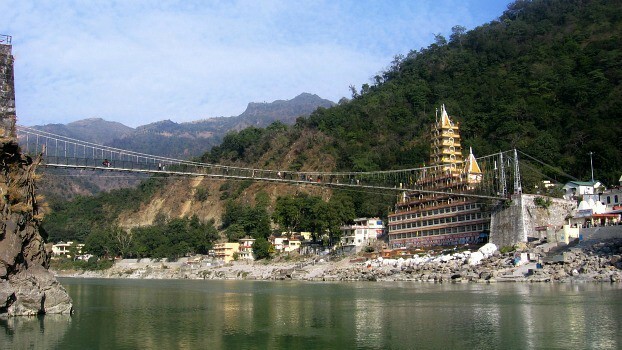 I went up there about two days after I moved in to discover a glorious panoramic view of the Ram Jhula end of Rishikesh. I can see the Ganga of course, and across the river the Parmath Niketan ashram. From my roof, I can watch and hear the evening aarti EVERY night if I want. This is the same aarti that helped me reconcile my Mother’s death. Also from my roof, I can see a few small buildings peeking through the trees up a rise on the edge of town: The Beatles ashram. So here I am in Rishikesh, my first home in India, feeling like I might have been destined to be here all along. It certainly is a “full circle” feeling. And it certainly is a relief to finally have a home base, and all my things in one place, for the first time in the 13 years I have been travelling here. Thanks to everyone who helped me along the way, I am very grateful.